It's been a while since I raced participated. My last race was in July last year shortly after which I stopped swimming due to shoulder soreness. Anyway, I was looking for some crazy tri swim start videos (shoot me a link to your favorites please) on YouTube and remembered the excitement and energy you feel just walking around before triathlons. I'm guessing this is what led to a frustrating dream which is now quite funny. I don't remember (or didn't dream about the swim portion) and not much of the bike except coming in to T2 at which time I realized, oh no, I forgot to eat or drink on the bike! That's right, ~4 hours in to the race with nothing. I was surprised I hadn't bonked yet and knew I would soon, so at T2 I stuffed all the food I was supposed to eat into the pockets of my tri shorts, and headed out on the run, for the first time. I got about 10 steps outside T2, which was in a building?? ?, and turned around to grab a water bottle then headed back out. This time when I got to the door, I realized I was wearing a jacket and long sleeve shirt which was too hot for the run so I turned around and took them both off, I couldn't figure out where to shove them so I got in line at coat check (lol) but that was taking too long so I went back to my bike and handed them to my sister (what the heck is she doing in New Orleans?). Then I turned around to to leave and realized I don't want to run with no shirt on and as I'm getting the shirt on realize I need my number belt which is buried in my tri bag. Anyway, finally off to the run, now having blown any chance at a sub 6 hour HIM, and a couple hundred feet into the run I realize, I'm not wearing any shoes! What the heck, now I'm getting angry. I contemplate running the 13.1 miles barefoot and quickly realize that is a bad idea. When I turned around, my sister is there laughing (that's what she was doing in my dream, big meany :-)). I woke up as I was heading back to T2 to get my shoes. Funny stuff. As for training, this was a recovery/taper week according to my plan. I didn't do the swimming because my shoulders are getting sore again like they did last July. I may not swim until the day before the race. Biking this week is 3 hours and I should get that in and running is a little under 2 hours and I should get that in as well. Tapering feels a little weird, kind of like recovery weeks do. I'm a little more tired and achy, specially at the start of my runs, but I feel much stronger at the end of my runs than I do during bigger volume weeks. Hopefully that is normal. 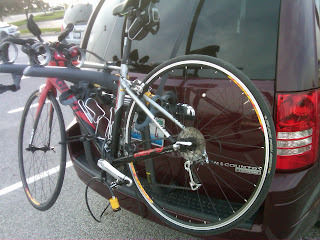 I did finally get around to trying out my Saris Bones 3 bike rack my parents gave me last November to make sure it will fit for our trip next week. It didn't fit exactly as the directions said, but with a little modification, it should work just fine. I put my bike on it and drove around a bit. I also went back to the doc and let her know about the race :-). She said no problem! We went over all my blood work, echo results and all that. She said I am a little low on salt, so I should increase my intake a little. I think I will take salt pills at NOLA. It is going to be humid and I sweat a lot. Time to start printing maps and making lists. I may take some pictures to go with the lists as James suggested to me. Funny dream. Sounds like my morning. I'm sure I'll tell you before you leave, but good luck! I was thinking about your race this morning on my run. Sooo cool..,I'm excited for you! Too funny! Happy to know that even with the many miles between us that I can still get under your skin. Not to worry, I'll be in Vegas next weekend. But now I wish I could sneak down to NO just to mess with you. Hey Mike - you know the taper is tough. I always feel 'off'. But remember, you are flat because your body is absorbing all of that training that you have exposed it to. You don't get BIGGER, FASTER, STRONGER during the workout but during the recovery. This is the first year that I have not raced NOLA - I am going to miss it but I am excited about Boston. Best of luck in NOLA.